Today was the last day of my four-day weekend. I used my first free-play coupon of the year from the Wigwam Restaurant casino, and along with a win $10-match $10 coupon and some good luck led to me winning no only this morning's breakfast back, but also one of the previous three day's breakfasts. That's a good start to the year, I reckon. For 2017, my reckoning shows that I had a net win of $243 from the Wigwam Casino, although I did spend $722 in meals there. (That's an average of one breakfast every weekend.) Since I like their food, I think this works out okay, and getting roughly 19 of 52 breakfasts free isn't too bad either. This afternoon, Lisa completed attaching the remaining roof brackets on the carport. We won't know for sure whether they work until we get some wind, but given the weather in Fernley, that shouldn't be too long. As the sun headed for the horizon, we unloaded the pallet (240 logs) of North Idaho Fire Logs. There looks like there is enough room in the wood box to buy another pallet and still get it under cover. (The logs must be kept dry or they will dissolve.) That's the equivalent of about two cords of cord-wood because the fire-logs burn so efficiently. We'll decide later this week about buying more of them now while we still have the utility trailer hitched to the Big Orange Van. 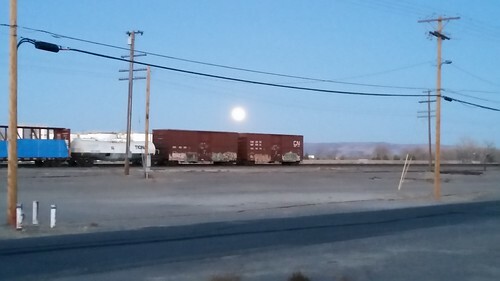 It was dusk when we finished up the household chores, and the first of this month's two full moons was rising over the rail yard. The full moon at the end of this month is also a lunar eclipse, I hear, and my work hours are such that I should get to see it. We had a different coupon for $20 free play for $10 from the Fernley Nugget, and Lisa wanted to get away from the house for a little while, so we popped down there to play her favorite slot machine. Luck continued to be with us, as we netted $10 above and beyond the $10 it cost to buy the $20 play. We can but hope that our gambling luck stays this good the rest of 2018, although we're not so foolish as to think it will do so. Those free drinks aren't actually free, after all. Now I have to get myself back onto my normal work schedule, which is hard after a luxurious four days of not having to get up to an alarm clock or hit any particular deadlines.